Fabulous East-coast traditional. 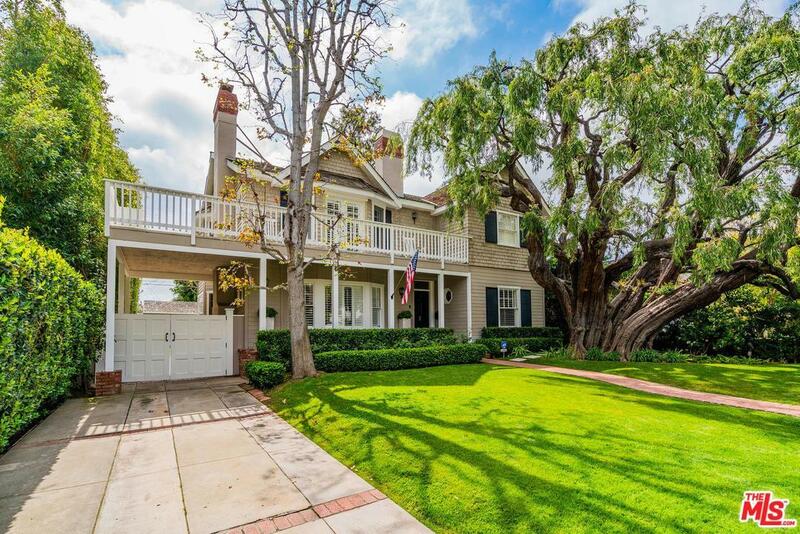 Professional landscaping w/ spectacular Australian Oak tree adds to the charm of this extensively remodeled 1939 4 bed, 4.5 bath 3,406 sq ft home. Ideal floorplan w/hw floors throughout. First level features bedroom, spacious living rm w/fireplace accented by original diamond Tutor glass windows, formal dining rm w/Pelle blown glass chandelier & plenty of natural light. Chief's kitchen has Wolf 8-burner range & dual oven, stainless Sub-Zero refrigeration & twin full-height glass door wine refrigerators. Full size laundry rm off kitchen. Second level features large master suite w/fireplace, spacious walk-in closet & wraparound balcony plus 2 en suite bedrooms. Finished garage w/ skylight & custom cabinets. Spacious 8,881 sq ft lot has carport, generous backyard w/firepit & large pool w/ custom Greek marble coping set in slate hardscape. Attractive farmers-door shed perfect for outdoor storage. Don't miss this Santa Monica gem!